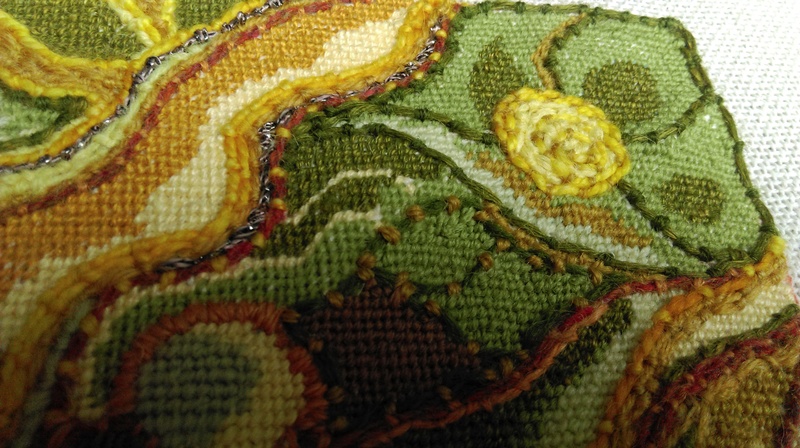 I was delighted to read the latest post from artist Stephanie Redfern this week, where she explains her decision to work in needlepoint. Stephanie understands completely the slow nature of this process and rather wonderfully refers to it as ‘slow motion magic painting’ – I love that! I smiled as I read some of the comments on her post – mention needlepoint, and patience is always the word that people associate with it. And yes, like Stephanie, my own patience does not extend far beyond the stitching. When I talk to people about the pieces I make, so often there’s amazement at anyone being prepared to take the time to create in this way, they generally ask why I choose to do it. And this is where I struggle to express myself adequately. Because however clichéd it may sound, hand stitching is one of those things you have to do, to appreciate the why. And then, with serendipitous timing, today I read the latest post from my stitching hero, Judy Martin. I’m sure Judy’s work is familiar to you, but if not, I urge you to see what she does, because I don’t know a better or purer expression of the power and beauty of hand stitching. And really, there, in a nutshell you have the whole story. There’s a wonderful article here by Martha Sielman, about Judy and her work which sensitively expands this expression – I’m sure it will resonate with all hand stitchers. 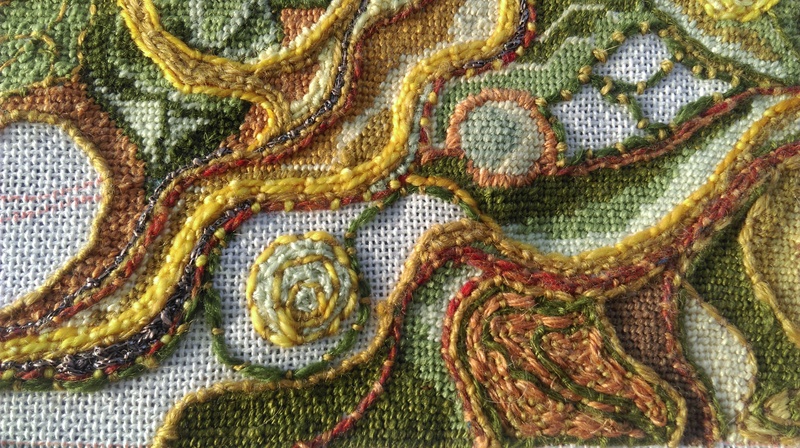 Pictures are details from the stitching of my latest piece of needlepoint embroidery, completed this week. Wonderful! Though I’ve been putting the slow, before the actual stitching lately. I understand excatly what you mean. I look forward to reading the articla and following the links! Well I’m sure that being slow is actually very much what we need at times 🙂 Do read the articles if you have a moment, the Martha Sielman is excellent. I do so understand this. I too love the precision of needlepoint and the ability to leave other issues behind when I am working. Exactly, it’s a wonderful way to get into the flow, I’m sure that’s why so many of us find it beneficial. Every time I see your pieces I think to myself “oh, I’d really like to do something like that, they are so inspiring” Then I tell myself very firmly that I have quite enough unfinished things about and diversify far too much already, and I can always come here and enjoy vicariously! 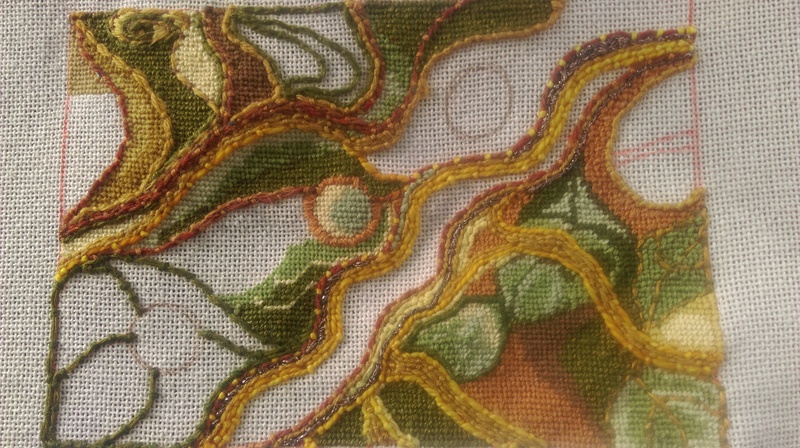 I seem to be in a real stitching lull at the moment as well, can’t settle to anything. Most unhelpful. This is looking just lovely, perfect for the season and evocative of all sorts of things the more you look. Is the tender little crescent moon intentional, and a late season delicate rose? Delightful. I love Judy’s work as well, it is so thought provoking and complete, if that’s not an odd word to use; shows one what can be done with dedicated attention and just keeping going. It sounds as if you’ve had your plate full anyway and health issues always drain your creative energies. I rather suspect that creative energies are cyclical and subject to natural ups and downs, better to go with it, don’t fight, you’ll definitely come up again when the time is right. BTW I’ve really loved some of your experimental stuff – this is all feeding your subconscious, it will flower when it’s ready. I think it takes a stitcher to understand a stitcher! True – it’s just a pity more people can’t see how it might help them too. Would you tell us what fabric you stitched this lovely piece on and its dimensions and what the different fibers are? Have you named it? When stitching, I sink into what I’m doing and feel insulated (however temporarily) from the world’s sling and arrows. Seems to be the slowing down that’s so soothing. Hello Victoria, thank you for your commenting 🙂 I’ve used cotton crash for this one – no, I haven’t named it just yet – I like to use soft, loose-weave materials for needlepoint. I’ve tried burlap/hessian, but I tend to find it too prickly on my skin, so mostly I use either linen scrim or cotton crash, although I’ve just bought some natural unscoured cotton, not tried that yet – I like to experiment! Threads – you name it, if I can stitch with it, I’ll try. This piece is mainly wools, silks and linen threads. I like texture and colour, so as long as the threads are strong enough to stand up to stitching and thin enough to go through the holes, I’ll try it. This is one of the small pieces – about 7 x 5 inches, 12 x 17cm. Most pieces are considerably bigger than this, but sometimes it’s good to work through an idea more quickly. I totally agree about the soothing nature of stitching, it’s the thing I always go to when I’m stressed. I love the connection that makes between other stitchers and those who went before. Hi Annie, lovely to hear from you. There’s something about the whole ‘slow’ thing that seems to draw you in and take you on a journey – I think perhaps modern life has detached us from some of the benefits of the slow exploration, and the need to reclaim those aspects resonates with many of us.